DETROIT (Jan. 29, 2019) – The most popular half-day educational series in the running industry is coming back in a big way for 2019, and may be landing in a city near you. 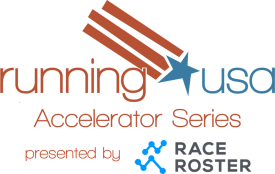 The Running USA Accelerator Series presented by Race Roster will present a third straight year of half day workshops around the U.S. and beyond, with engaging topics rooted in the most immediate needs of endurance industry professionals. “We reached six cities in 2018, and after every single session feedback was overwhelmingly positive. We know the industry is hungry for the latest knowledge about sponsorship, marketing, runner retention and operational trends, so we’re thrilled that Race Roster is partnering with us for the third year,” said Christine Bowen, vice president of programming, partnerships and operations for Running USA. Speakers for the events will be announced along with the tour dates. Topics will be aided by the results of the recent Running USA Event Management Study, which asked race production professionals about their most pressing needs. Race Roster team members will be on hand at the Running USA Industry Conference Expo in San Juan, Puerto next month to talk about the Accelerator Series and how it can benefit your business. Visit them in Expo Ballroom B at Booth No. 315. Running USA is a tax-exempt, not-for-profit organization devoted to improving the status and experience of distance running and racing in the United States through collective marketing and promotions, information and communications within the industry and to the national media, services to events and industry members, and the development of American world class stars. It seeks the advancement of the sport and the provision of value to each of its members’ events and businesses. For more information, visit RunningUSA.org.